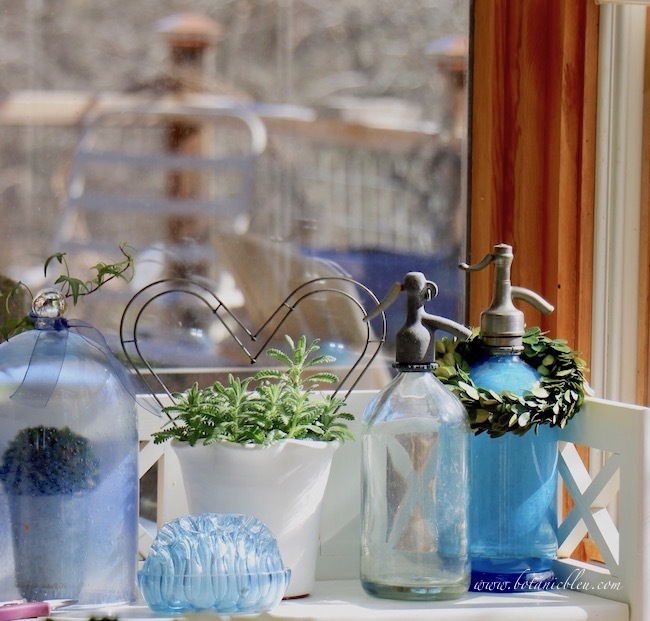 Take a cue from your home's everyday colors. Use those colors for a Valentine's Day table to create a table setting that complements other things in the same room. 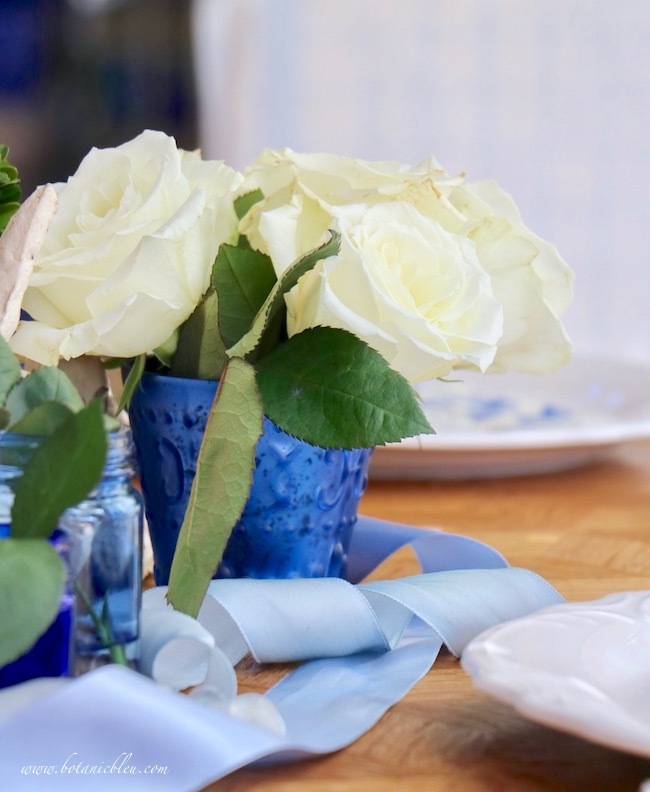 A blue and white Valentine Day's table was inspired by the blue and white items on a bookshelf in the same room as the table. The double wire heart adds a little Valentine's Day romance to a space of any color. 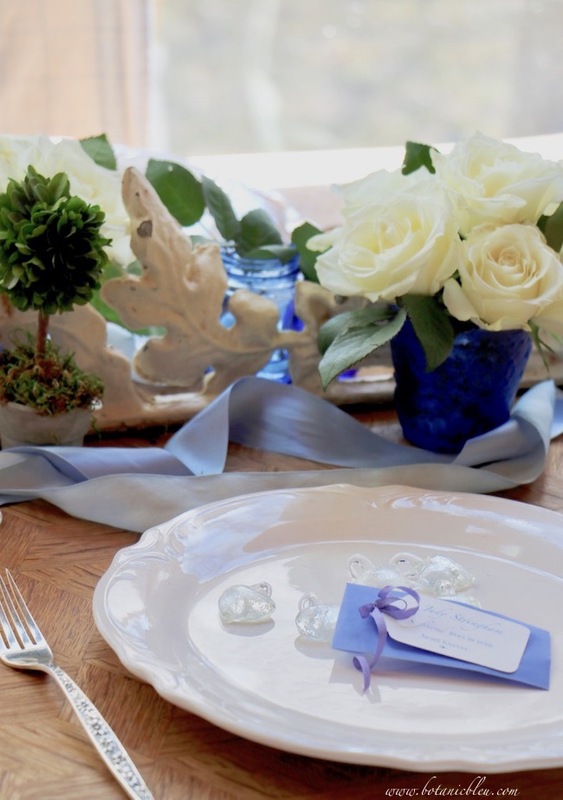 A romantic table does not have to be elaborate. 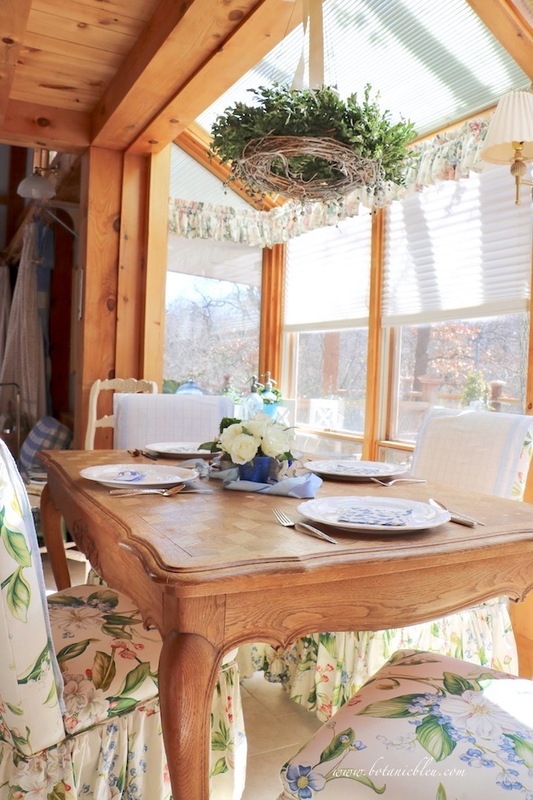 The table does not have to be filled with dishes, glasses, or candles. 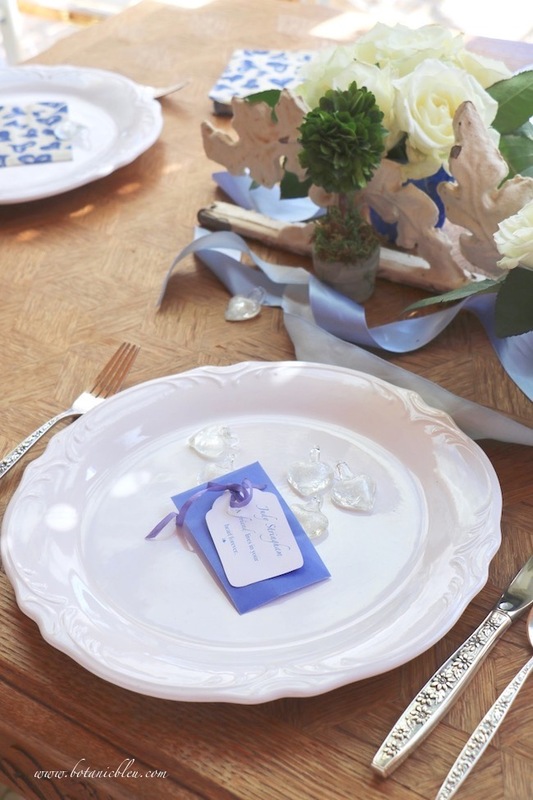 Simple place settings become romantic with the addition of hearts and flowers, time honored symbols of romance. 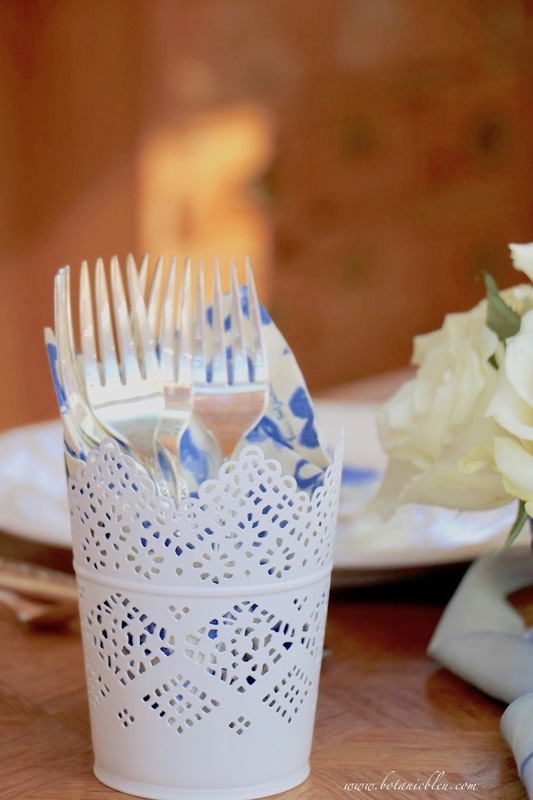 A simple metal tin holding extra napkins and dessert forks adds romance with its lacy design. 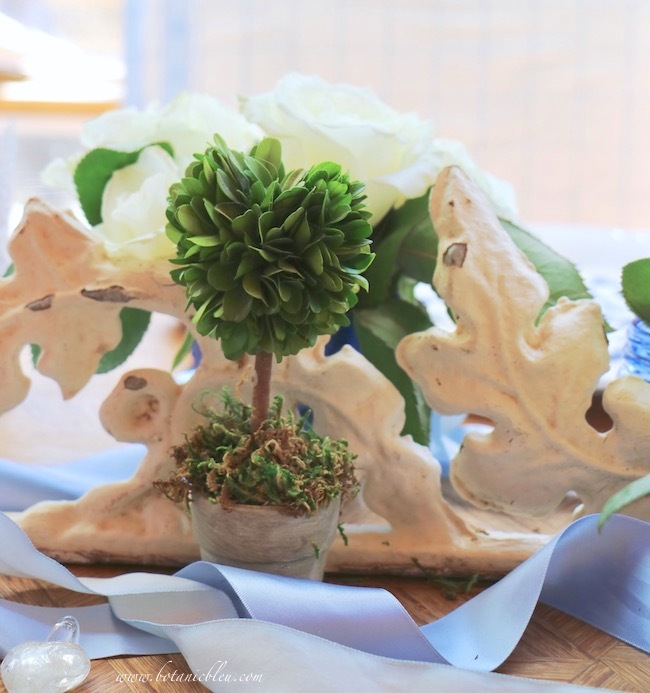 While this centerpiece has roses, romantic flowers for Valentine's Day do not have to be roses. Favorite flowers of a loved one are more romantic than traditional Valentine Day's roses. Knowing your special someone's flower preferences says L O V E much more than a dozen roses. 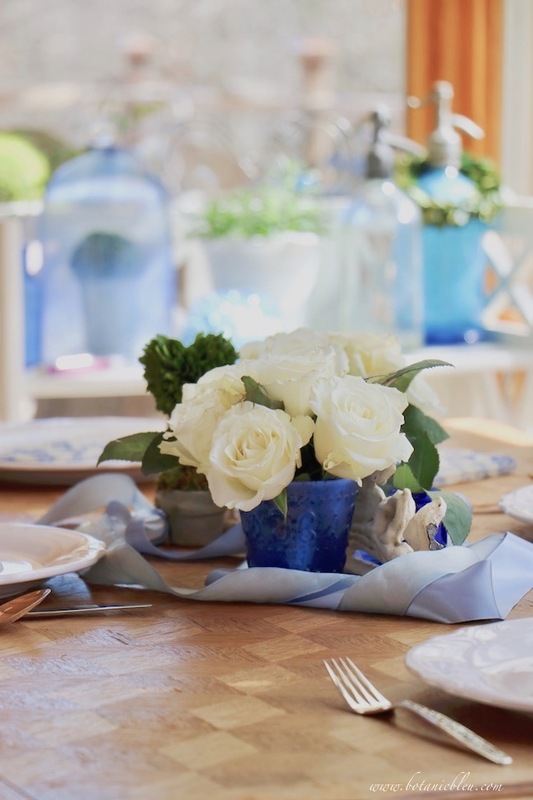 Five things that do make a Valentine's table romantic. Even more than roses, hearts symbolize love and romance. 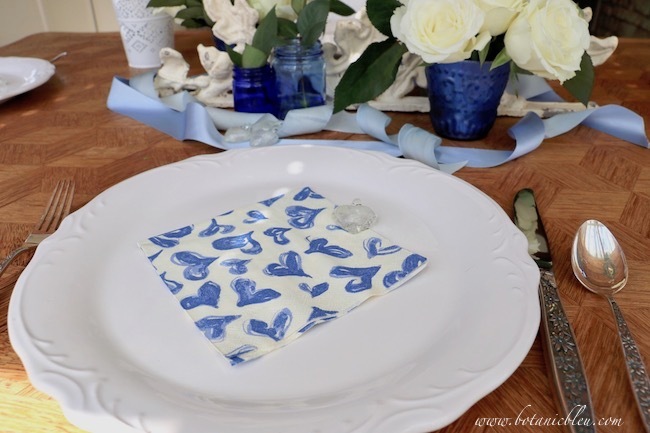 Add a paper napkin filled with blue hearts and a single white glass heart to each plate for a touch of romance. 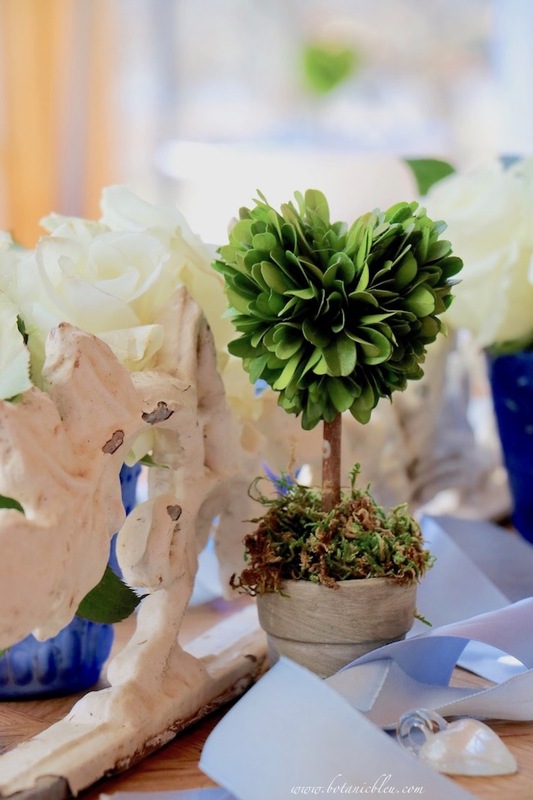 Small boxwood heart topiaries instantly elevate a centerpiece to a romantic setting. 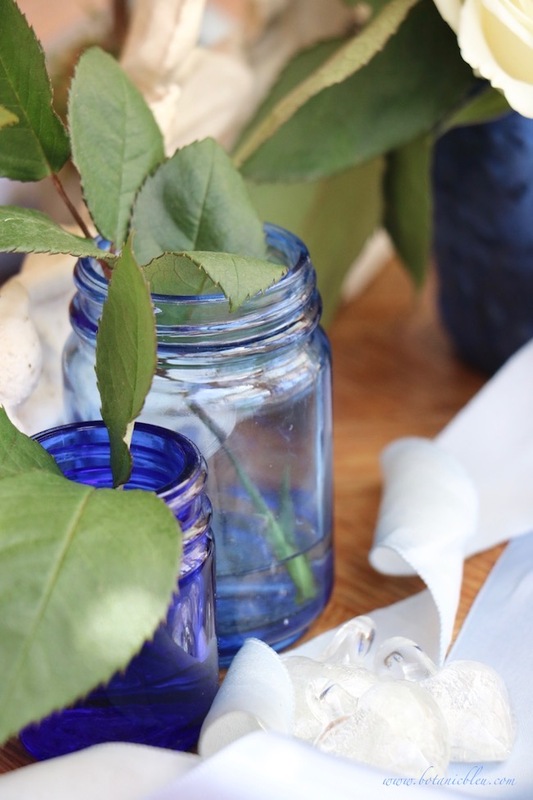 Curled ribbons soften any setting and create romance. 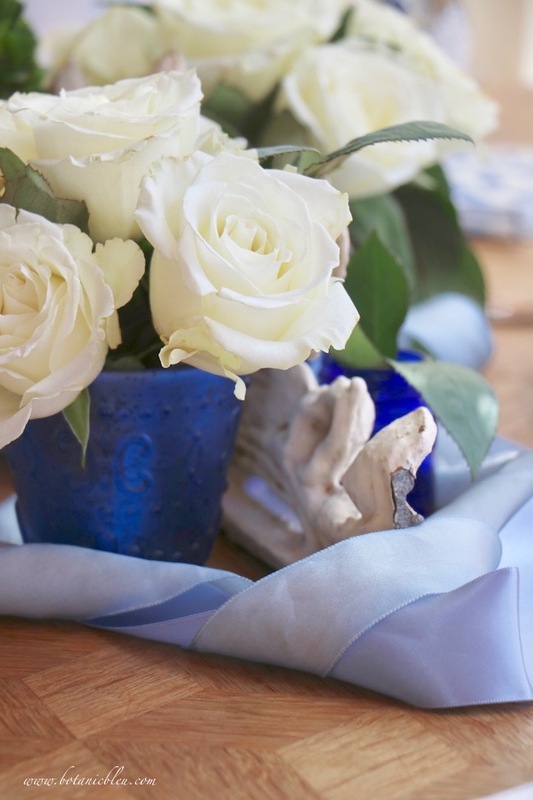 Two blue ribbons encircle the centerpiece. 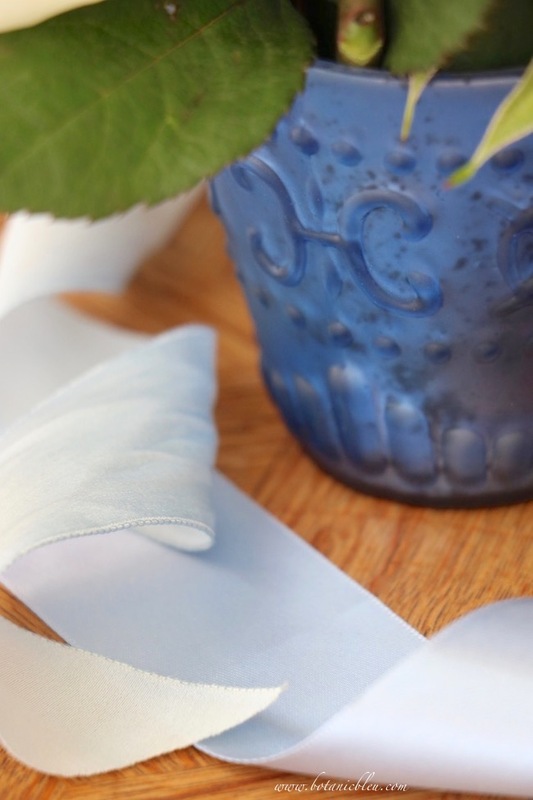 Small ribbons tied to individual place cards add romance to the business-shaped rectangular envelopes. For those who love vintage chippy pieces, an old piece of white iron makes their hearts flutter. One fragment of a salvaged vintage porch railing is worth more to them than any new shiny perfect expensive gift. Once more, knowing your true love's passions is a perfect romantic gesture. 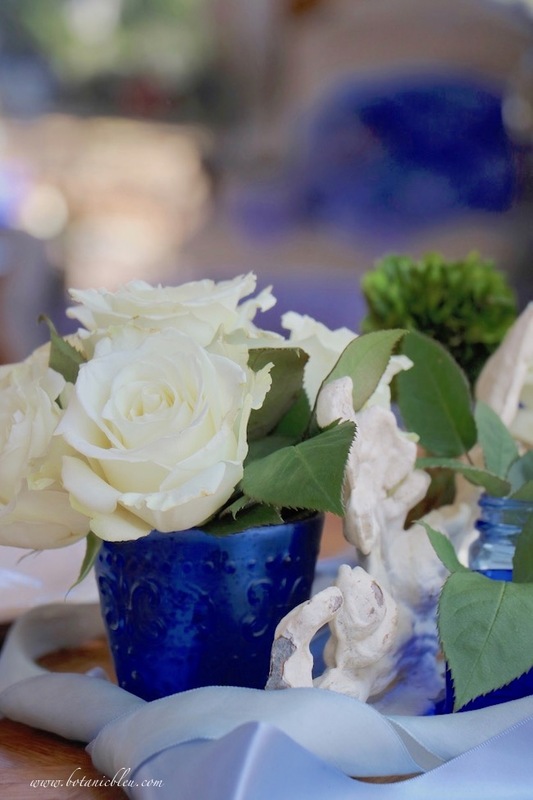 Vintage Vicks cobalt jars are beautiful repurposed as small vases in a blue and white centerpiece. And, vases can hold rose leaves alone instead of flowers. 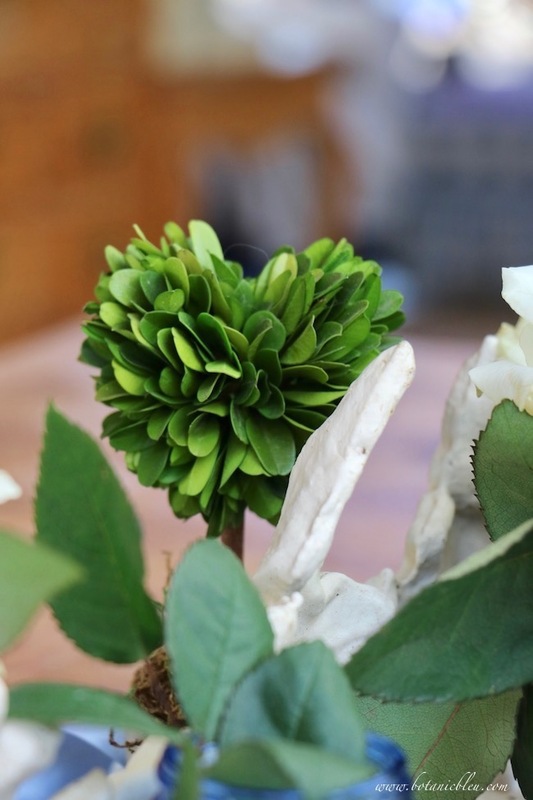 There's something stunning about the simplicity of notched rose leaves' edges. 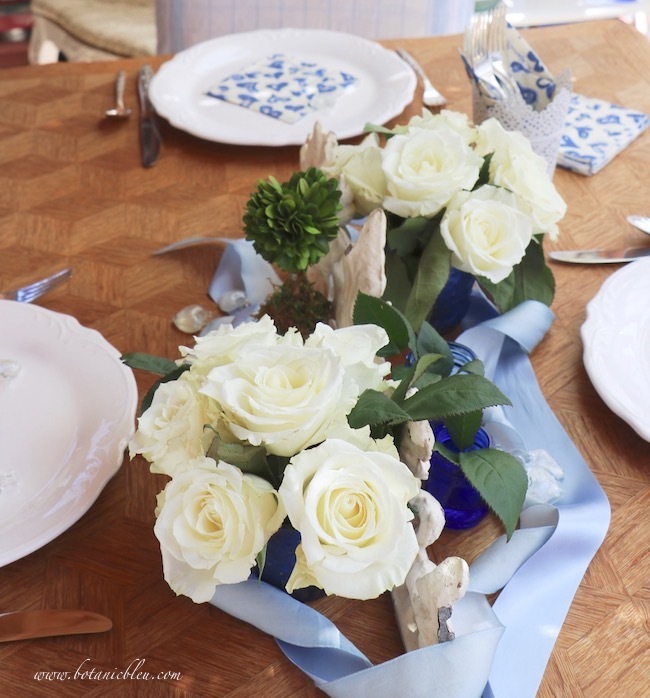 What better way to add romance to a table than to use French style? Full blown roses with heady aromas are fundamental French style. Any flower with large blowsy blooms, like peonies, is French style. French style patterns include fleur de lis. But, other patterns are also French looking. This pattern of a connected C and backwards C is reminiscent of the interlocking Cs of Coco Chanel and the interlocking D and C found at Château de Chenonceau. A friend lives in your heart forever. Words of love are not just for lovers. Loving quotes to family and friends remind them how much they mean to you. A quote is a small gesture that is long remembered. A post is coming with directions and templates for creating this special place card envelope. 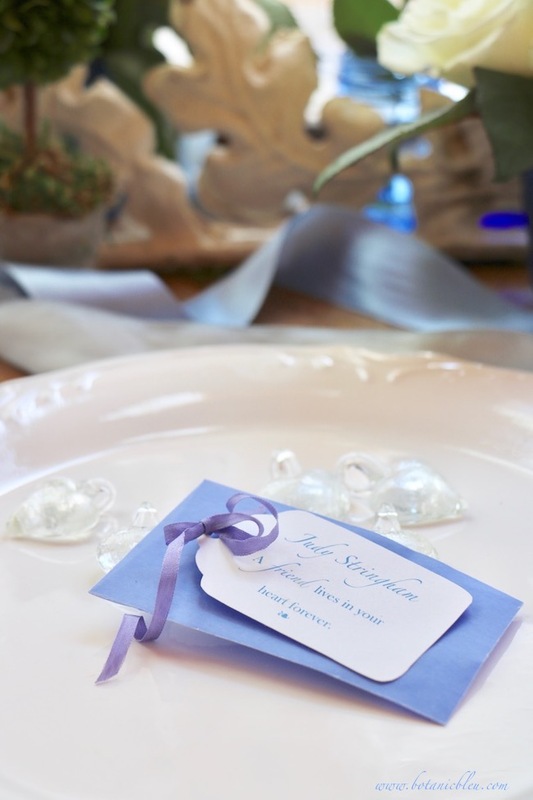 This quote is perfect for enclosing a small glass heart in the envelope as a party favor. I hope you have been inspired to create a romantic Valentine table setting in the colors you love. Beautiful! Love those seltzer bottles. I agree that a table doesn’t have to be valentine-y to be romantic! Dreamy photos and great ideas! Blue and white is always appropriate. You do it well. This is lovely in every single way. I'm a big sucker for blue and white. It's one of my favorite combinations and it's fun to see it as a Valentine table, because really, it's all about the love. Another simple but elegant table, as always, Judith. It’s beautiful!